Apple Blueberry Muffins are a delicious grab and go option that’s perfect for breakfast or an afternoon snack. 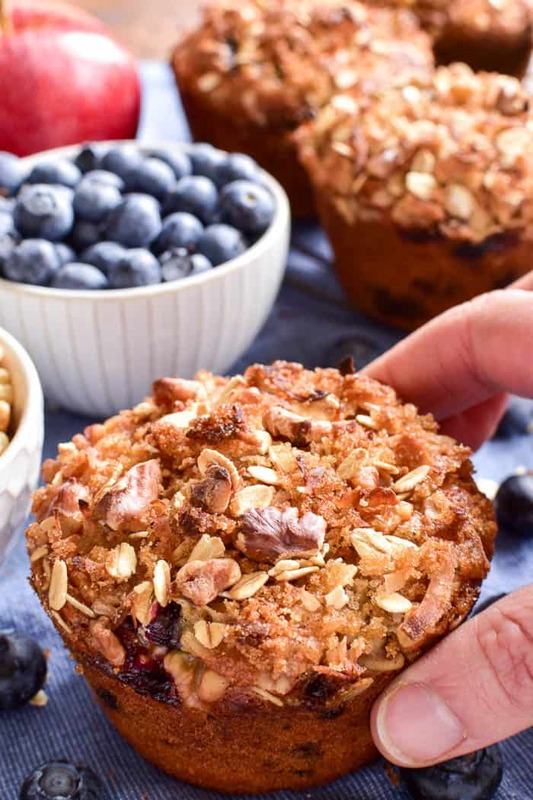 These superfood muffins combine two favorites in one yummy breakfast treat that’s loaded with superfoods and topped with a sweet, crunchy topping. If you love blueberry muffins, you’ll love this apple blueberry twist….perfect for the whole family! Remember the feeling of going back to school after spring break? Aside from the obvious feelings of dread (who ever wants to go back to school after a long break?) there’s also the promise of another, much longer break just around the corner. Even though it’s hard to believe, based on the current 40 degree temperatures we’re having, summer break is now just two short months away. And even though I’m not panicking quite yet….I am realizing that NOW is the time to be thinking about it. So I’ve been busy signing the kids up for summer school and swimming lessons and day camps. Because if there’s one thing I’ve realized after all my years of parenting, it’s that having lots of plans is better than having no plans. Especially when it comes to summer. Of course, having lots of plans requires a certain level of planning in and of itself. Who needs to be where, when? What do they need to have with them? How can we make it fair for everyone? And, perhaps most importantly, what will be be eating if we’re constantly on the go?? I don’t know you, but around here, the question of what we’ll be eating is real. It’s a question I probably get asked no less than 12 times a day….and that’s when the kids are in school. Which means that when they’re home for the summer? Having easy, go-to options is EVERYTHING. 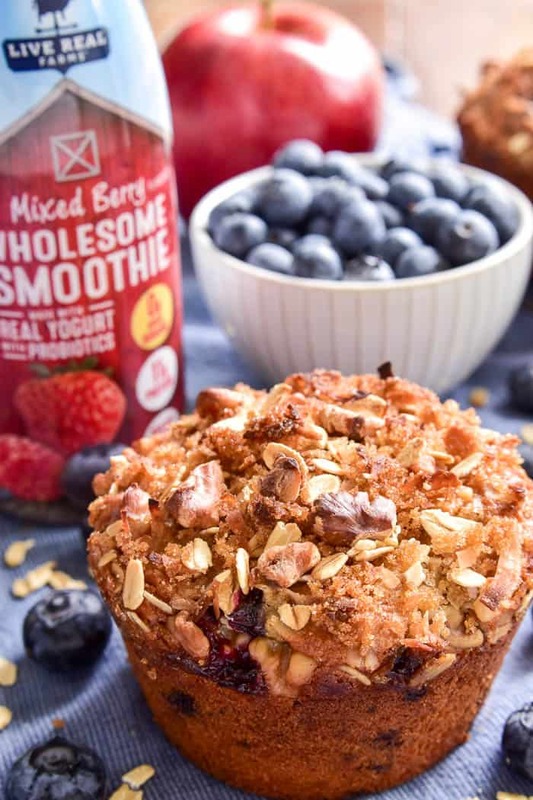 We have our old standbys, like fruit and veggies and Cranberry Almond Joy Granola Bars and these Superfood Apple Blueberry Muffins, but even better is when I run across a new option. Something they’ve never tried before. 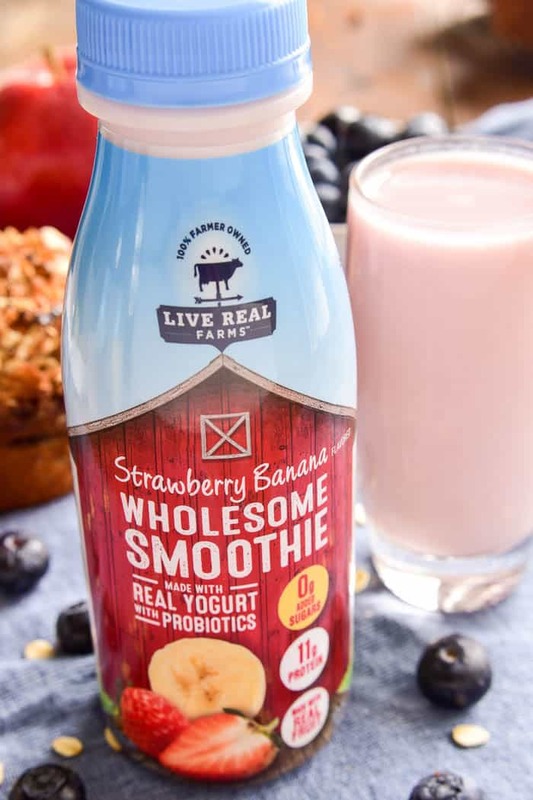 Like these Live Real Farms Wholesome Smoothies. I was recently introduced to these smoothies, and to say I’m a fan is an understatement. They’re all natural and loaded with probiotics, with no added sugar and 9 grams of protein per serving. I found at my local Pick ‘n Save… and best of all? My kids ADORE them. They’re smooth, creamy, and super satisfying. And since they come in three flavors and two different sizes, they’re perfect for enjoying anytime! 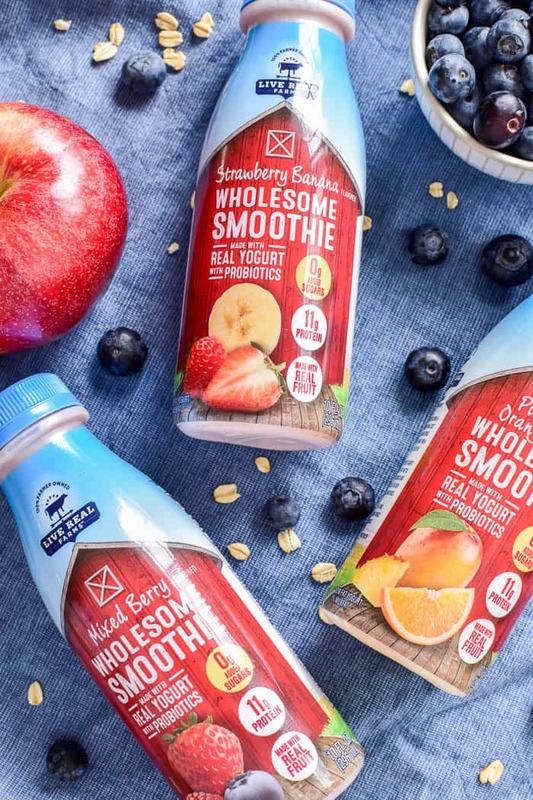 I can see us pouring a quick smoothie for breakfast and packing a cooler with smaller bottles for an easy on-the-go snack. Basically, the question of what to eat this summer just got a whole lot easier! 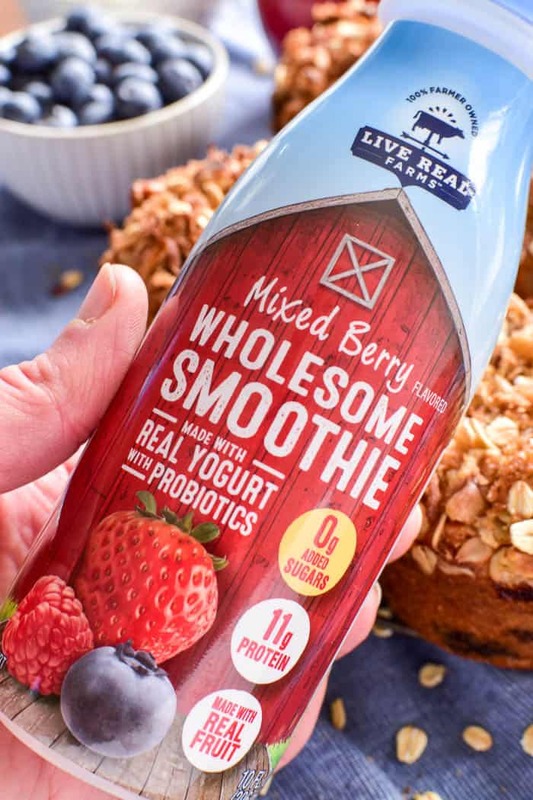 These Live Real Farms Wholesome Smoothies are delicious all on their own, and equally delicious when you pair them with my Apple Blueberry Muffins. And since these muffins are packed with superfoods like Greek yogurt, flax seed, raw honey, and chia, it’s a combo that’s not only delicious, but good for you, too! My kids devoured the entire batch of muffins without even realizing they were “healthy”. Which, let’s be honest, is actually the best case scenario. If I can get them to eat things that taste good and are also good for them? I’d say I’m already winning at this whole summer thing. Yes! Muffins can absolutely be healthy, depending on the ingredients you use to make them. Although many store bought muffins have the reputation of being high in calories, sugar, and fat, you can easily make homemade muffins that are packed with nutrients and actually good for you. A good place to start is with a list of superfoods! A superfood is a nutrient-rich food considered to be especially beneficial for health and well-being. 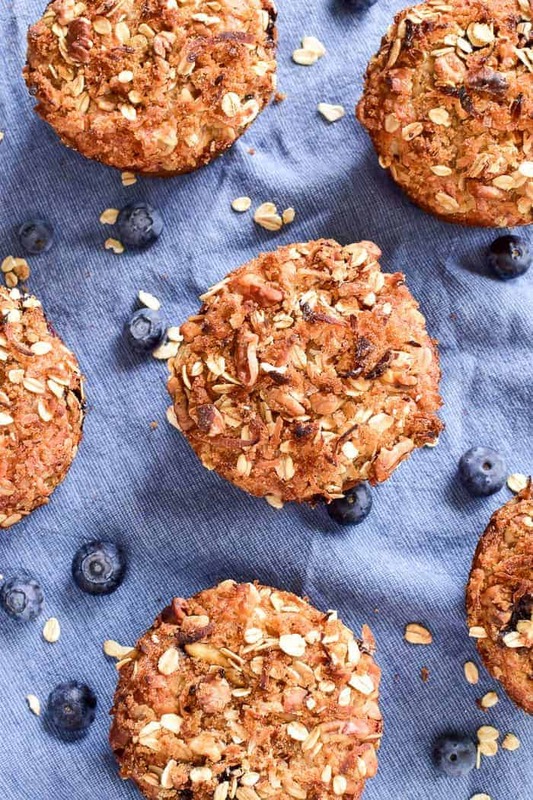 These Apple Blueberry Muffins are packed with superfoods like apples, blueberries, flax seed, Greek yogurt, rolled oats, raw honey, and chia. Some of our other favorite superfood recipes? This Strawberry Spinach Salad and this Sweet Potato Kale Quinoa! 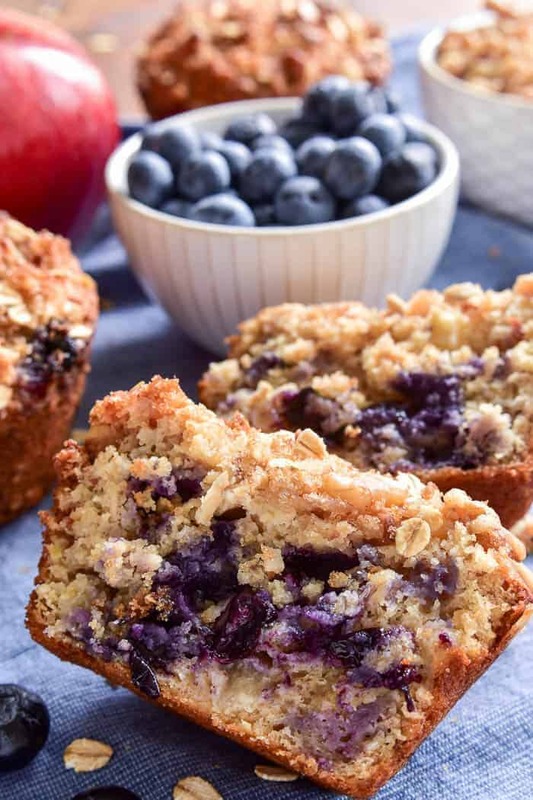 Apple Blueberry Muffins are a delicious grab and go option that’s perfect for breakfast or an afternoon snack. These muffins combine two favorites in one yummy breakfast treat that’s loaded with superfoods and topped with a sweet, crunchy topping. Preheat oven to 400°. Grease one 12 cup muffin tin or one 6 cup jumbo muffin tin. Set aside. In a large mixing bowl, combine egg, milk, oil, applesauce Greek yogurt, honey, and brown sugar. Stir. In a separate mixing bowl, combine flour, oats, flax, chia, baking powder, and salt. Add to wet ingredients and mix just until all ingredients are combined. Gently fold in chopped apples and blueberries. Spoon into prepared muffin tins, filling each cup 3/4 full. Combine topping ingredients; divide evenly among muffins. Press topping down gently. Bake at 400° 20 minutes for 12 muffins or 25 minutes for 6 muffins. Remove from oven; let cool 15 minutes in pan. Remove to wire rack to cool completely. These look absolutely amazing, they will make for the perfect snack! These muffins are gorgeous! I love the texture of these muffins! These muffins look crazy good! Wish I had one in front of me this morning. 🙂 And I am definitely going to have to look for those smoothies the next time I am at the store. I love your flavor combo! These would make a great breakfast! I am going to add these to my list of must make foods. Thanks for sharing. Breakfast is served! These look fantastic! These look so hearty and delicious! I hope I can find the smoothies around here!